I thought I’d pop in on a Friday morning with a fun gift box idea. 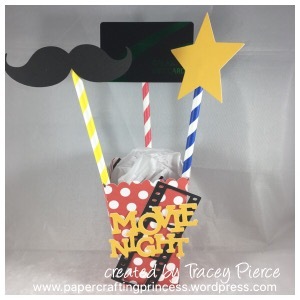 I needed a fun way to display a movie gift card and saw a cute idea on Pinterest, so I grabbed my Artiste cartridge and started cutting away. I used paper straws to hold up my gift card and shapes. I think I’ll be using this idea in card form too so stay tuned! Thanks for stopping by on a Friday…enjoy your weekend.